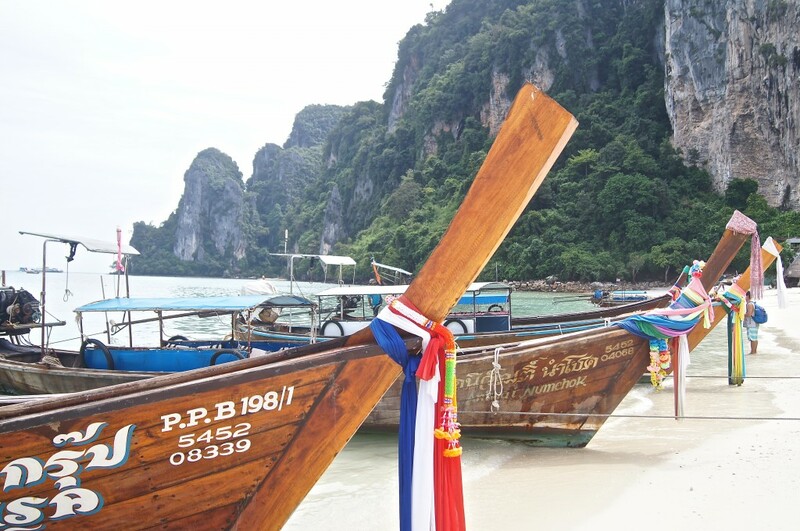 The one thing most people want to do when they are in Phuket is to take a Phuket islands boat tour. 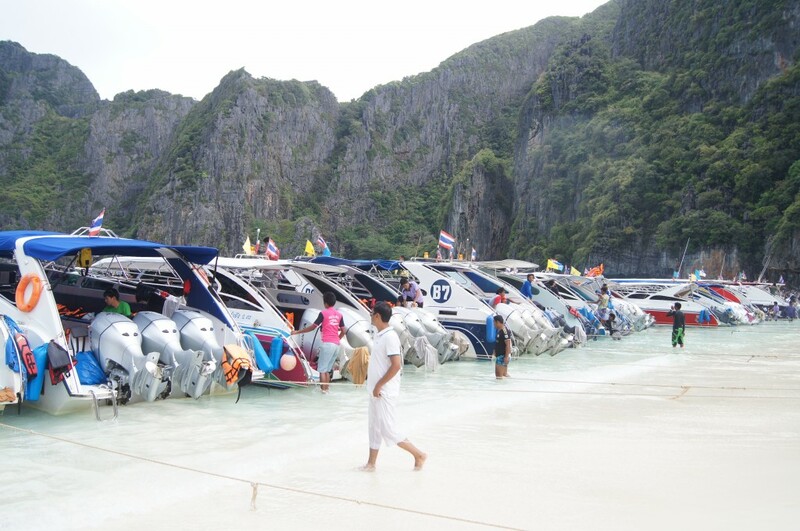 The most popular being Phi Phi Island. So how do you choose the right tour, or know who is a reputable company and what is a reasonable price. I had procrastinated for days about booking a tour with one of the many companies that line the streets of Patong Beach. There is literally a tour desk every second shop and as much as I wanted to enquire at a few to compare each, I just felt put off because of the prospect of a hard sell. So before you head to the nearest tour desk ask yourself the following questions. How safe is the company? Do they supply life jackets? Do they have a first aid kit? What type of boat are you going on? How many islands or stops does it include? Is food provided in the cost? Do they provide pick up from your hotel? Does the tour guide speak your language? So after looking at a few options on the street, I decided to go to my hotel’s tour booking agency and get the low down on tours. The guy that operated this tour agency (Jita Tours) recommended a new company that had been operating for around two weeks and that he was quite impressed with this company. Okay, so I was a little trusting in this man’s word, agreed to book with Hibiscus Tours and hoped that this tour was going to live up to the expectations I now had. The brochure itself looked very nice and what they offered seemed perfect for what I wanted to see. Now a lot of people do say that if you book through your hotel expect to pay a bit more for the tour. 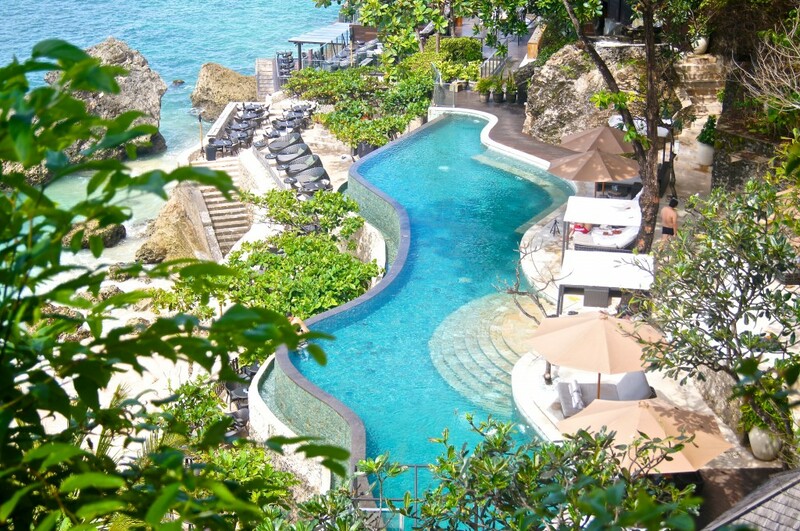 Whilst this is true – you can still negotiate a price with your hotel tour desk. This tour cost me $70 Australian dollars for an all day tour including lunch. 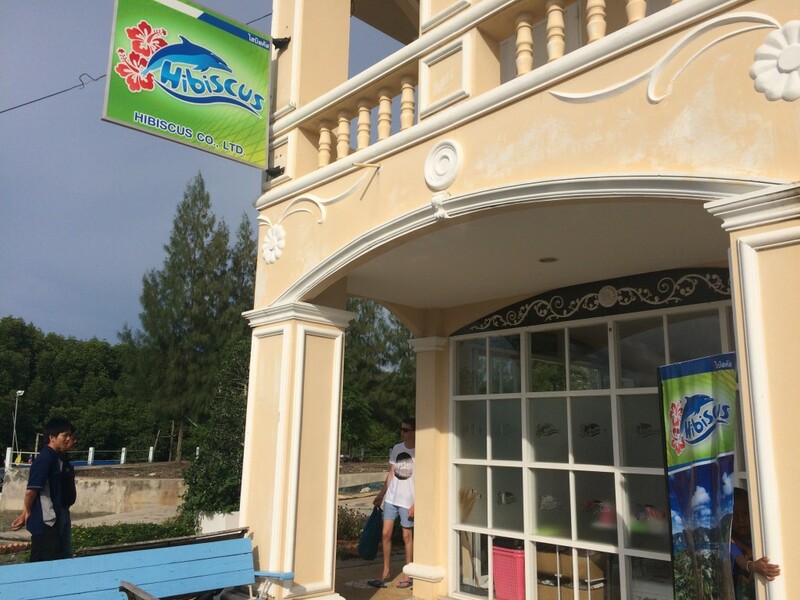 Hibiscus Tour is a new company on the Phuket Island day tour circuit. 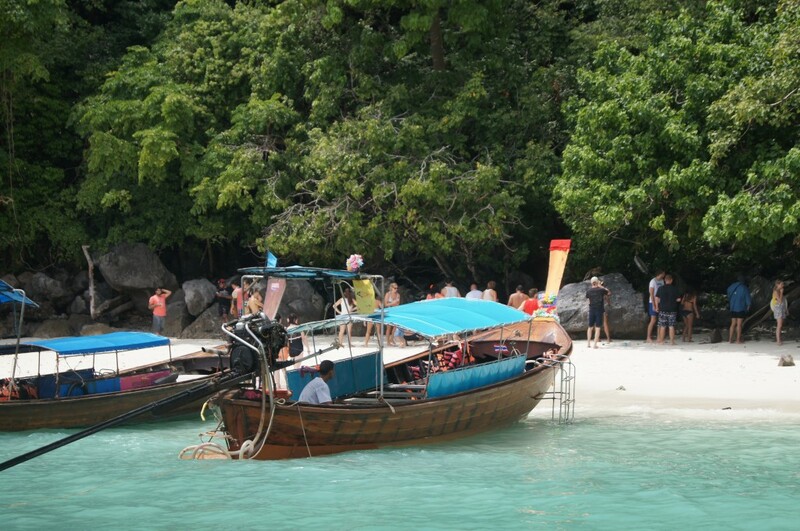 It offers a one day trip to Phi Phi Island, Maya Bay and Khai Nok Island. There are also other scheduled stops included in this tour. This tour group operates with a small group and you will be travelling via speed boat at high speeds and for some people this may be a little nerve racking when passing many other boats in the sea. 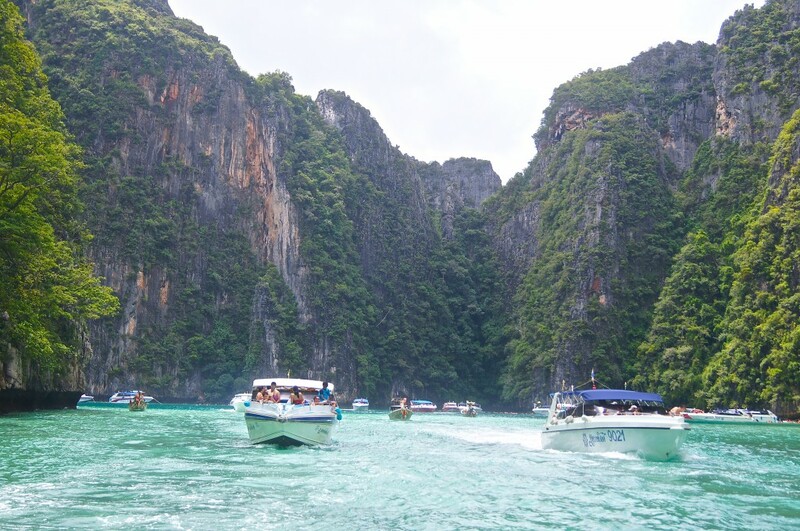 The advantage of going by speed boat is not only getting to each island quicker but you do not have to dock at a pier or take a small boat to the shore. Speed boats can pull right up to the shore. I was picked up at my hotel by the pre-arranged (by the tour company) minivan at 7.45 in the morning. I was the last hotel stop and there were already nine of us on this tour. Four others then joined the group at the Asia Marina where the boat left from. So in total it was a nice small group. Once at the Marina you are assembled into areas where the tour companies depart from. We were introduced to our tour guide by the name of Knuit (forgive me for the spelling). He was a young, English speaking guide who had a personable, friendly approach to the group. He then gave us all wristbands so we could be identified as part of the Hibiscus tour group. We were offered tea and coffee and snacks before the tour talk started. First up was general run down of what the tour was about and what to expect, followed by a talk about safety in and out of the boat. Now on the brochure it says what you are required to bring and what it doesn’t say is to bring some extra cash. Not that you are required to pay for anything more on the tour but there were optional things such as hiring flippers for 100 baht and purchasing peanuts for the monkeys which were 40 baht. You may want to buy an ice-cream or a soft drink on the islands, so I would suggest you bring enough cash for incidentals. Our bags were left on the boat and someone was there to watch over our belongings whenever we left the boat. I did not hire the flippers as my feet were too small for them which would render them useless if they fell off. 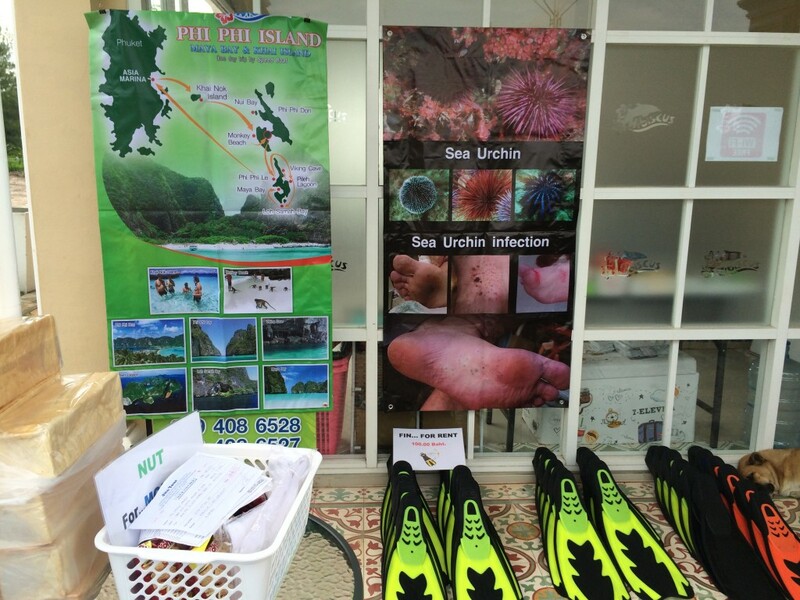 Main reason they wanted you to hire them was when you went snorkelling it offered protection for your feet if you grazed a sea urchin on the rocks under water. 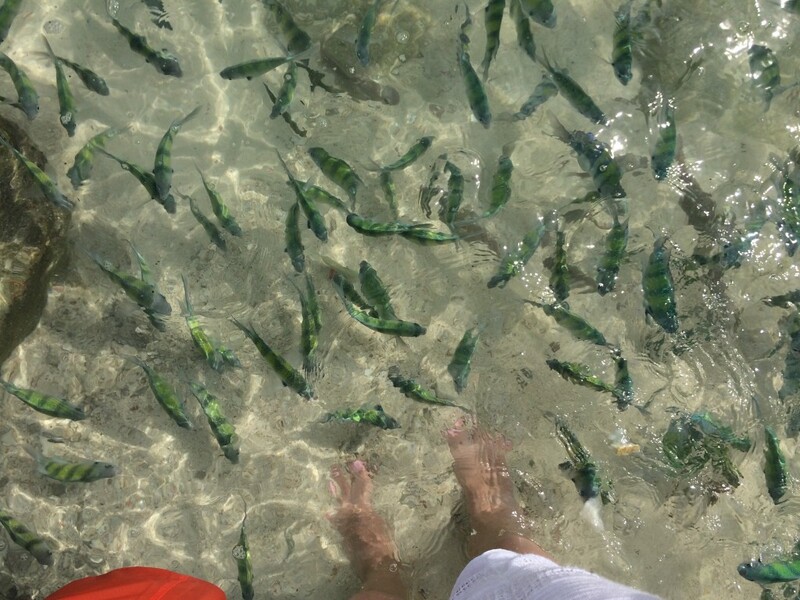 I kept my feet up high and the water was clear to see where the rocks were, so there was no issue for myself not having flippers while snorkelling but it is a good reason to wear them. There were no flippers provided for children at the time of writing this article. Once the introduction to the tour finished, we were all escorted down to the pier and helped onto the speed boat. These boats move at an extreme pace so it’s just best to sit down and enjoy the ride. On our tour we did the reverse route of what was advertised on the brochure and this can occur due to many reasons such as weather conditions and tides. 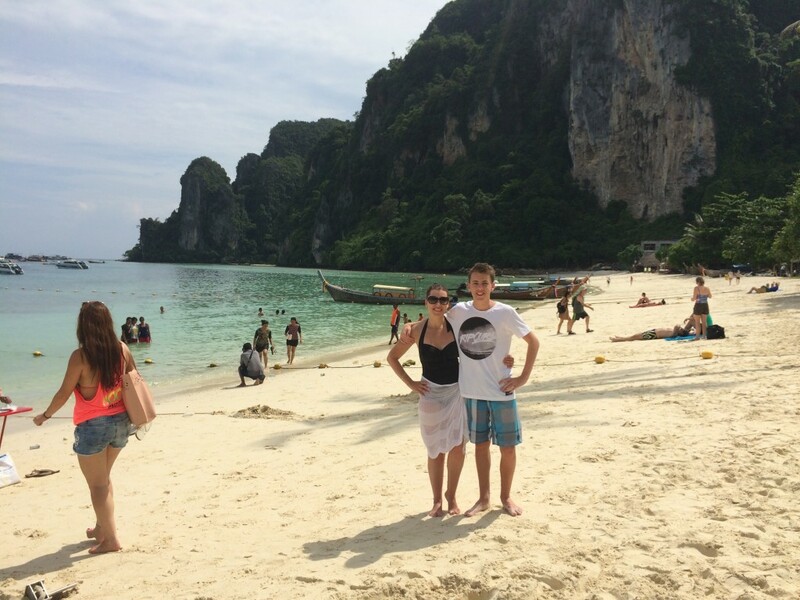 Maya Bay was the first stop (which is part of Phi Phi Le) we spent about 45 minutes here. The movie “The Beach” starring Leonardo Dicaprio was filmed on this island. The guide escorted us to where the viewing platform was, showed us the other facilities on the island and then we were given free time for about 30 minutes. This was plenty of time to have a look around, take a few photographs of the old boats, wade in the water and take a few shots of the general area. There isn’t a lot to do on the island and it is quite crowded with tourists. So don’t expect to have the beach to yourself! These stops weren’t actual stops but a sail past and slow down for a look and for photo opportunities. 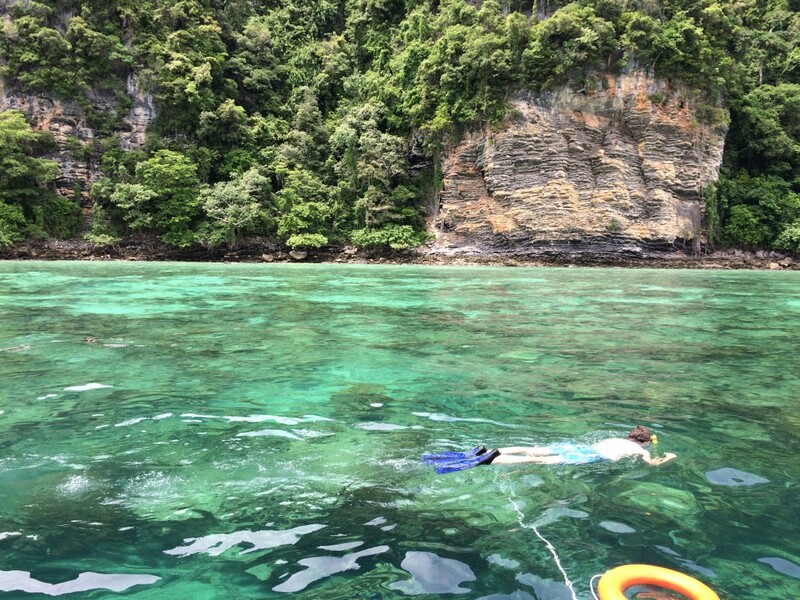 We did leave the boat for some snorkelling for about 15 minutes near Loh Samah Bay. 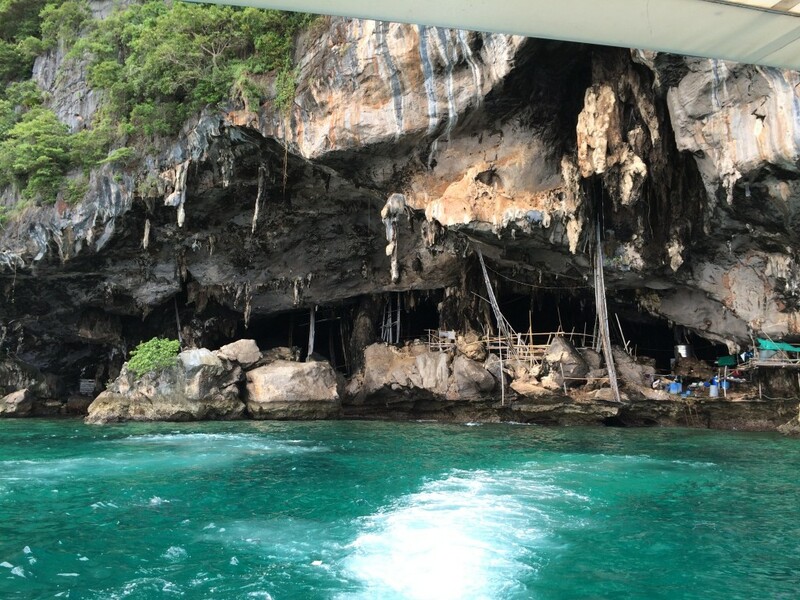 A sail past the pirate caves, where by the boat slowed down for us to take photos. This stop was for around ten to fifteen minutes to see and feed the monkeys. We were told by our guide to be careful as sometimes these monkeys can be aggressive, especially mothers protecting their babies. We purchased peanuts for 40 baht at the beginning of the tour and they seemed to be quite fussy with what they liked to eat. If you had bread they didn’t want to know you. Some people on other tours where putting themselves in dangerous positions where they were laying down with the monkeys, our tour guide warned these people of the dangers. 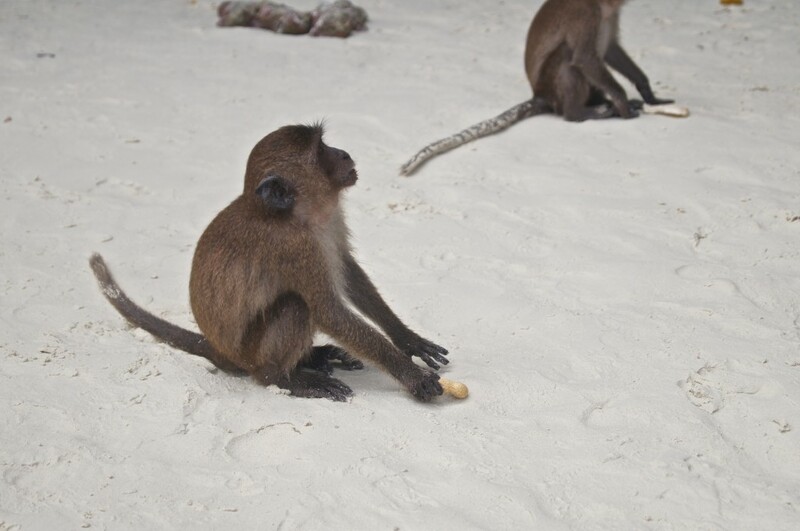 The monkeys carry diseases with no vaccine available so you don’t want to put yourself into a position where you may be bitten or scratched. 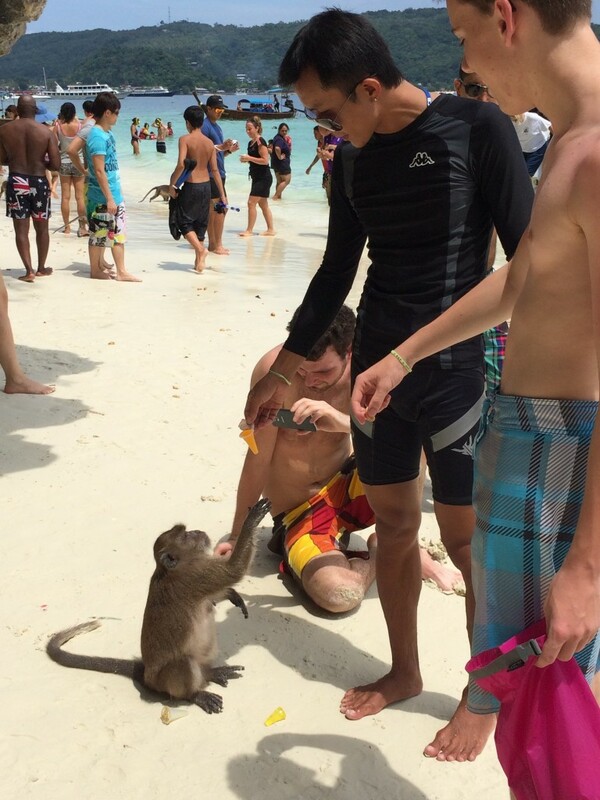 It’s best to just throw the peanuts in the vicinity of the monkey rather than letting them take it from your hand. 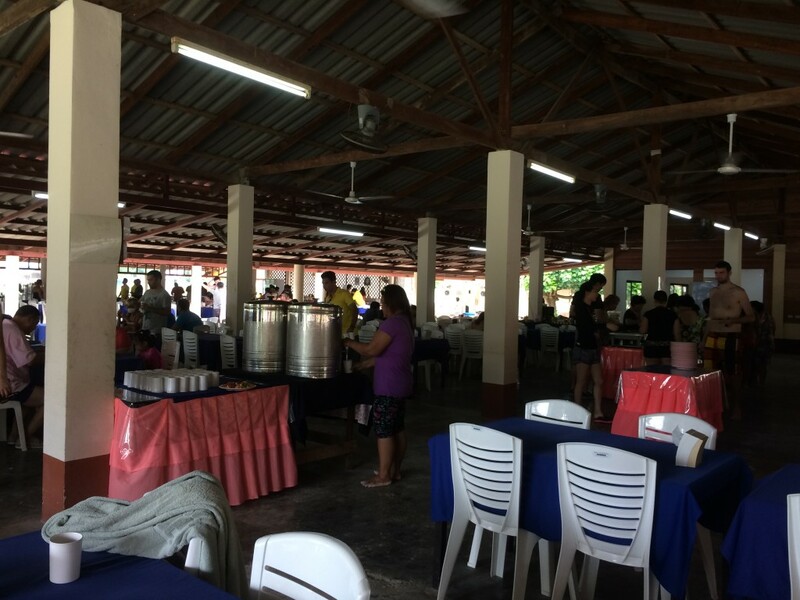 A buffet style lunch was provided on Phi Phi Don Island and was held in a large pavilion. Don’t expect anything fancy here it is budget food! After lunch we had some free time to walk around, take some photos and relax on the beach. 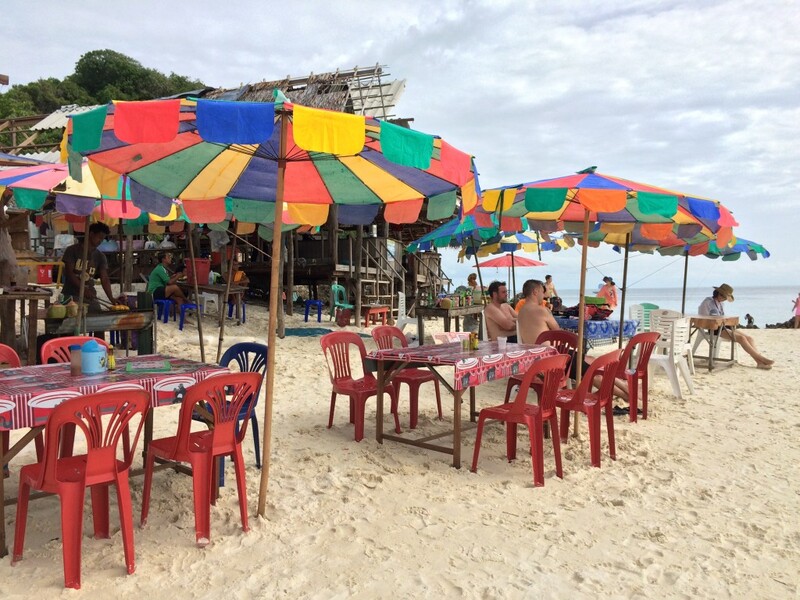 The final stop was at Khai Nok Island where you could explore the area at your own leisure. 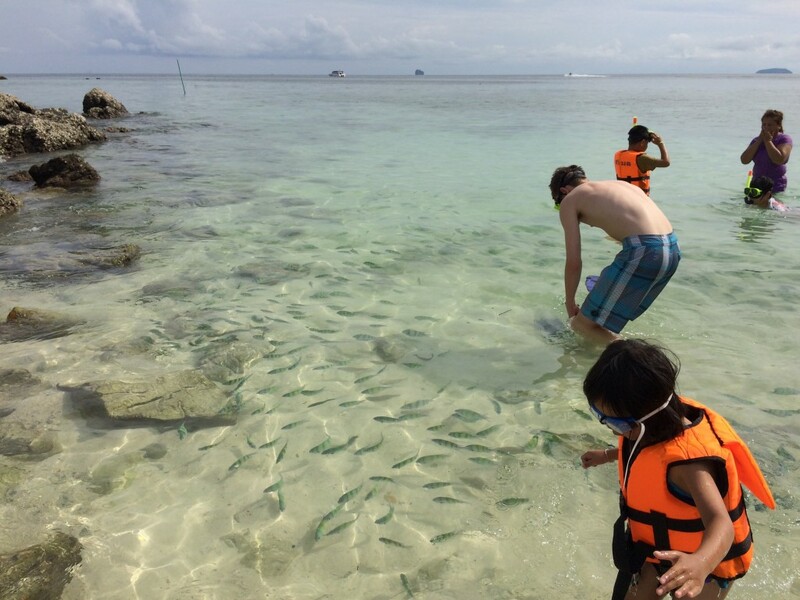 Our tour guide showed us a quiet spot where we could snorkel and feed the fish. The island has a couple of cafe’s and a bar if you wished to buy something to eat or have a drink at the bar. Light weight clothes such as a t-shirt/shorts or a dress – a sarong is ideal for once you start getting on and off the boat when you have wet swimwear. Sandals, flip flops or comfortable shoes. I was really impressed with the tour. The tour guide was friendly, knowledgable and he had a good sense of humour. The guide was alert to our safety at all times, which is a primary concern when you go on these type of tours. I think at times the tour would have benefited from the guide having a small microphone to project his voice, as when the boat is travelling at high speed it is difficult to hear what was being said. 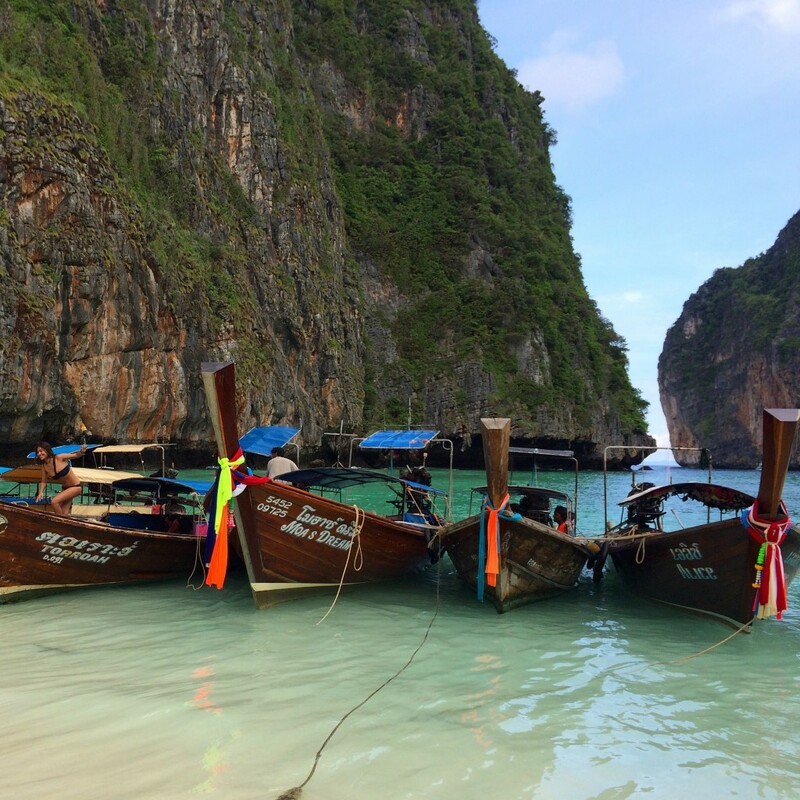 I really enjoyed all the stops on this tour, especially Maya Bay and the final stop Khai Nok Island. Some stops were brief but you can’t expect too much when you only have a day to visit.